There would not be too many shooters out there who are unaware of the SOG range of knives and tools. However, I wonder how many of them know where the name came from. SOG stands for Studies and Observation Group - this was an elite joint services military group, which operated in Vietnam. Their specialty was covert operations. A unique group, they designed and developed their own equipment and the SOG required knives for specific uses in a harsh and violent environment. 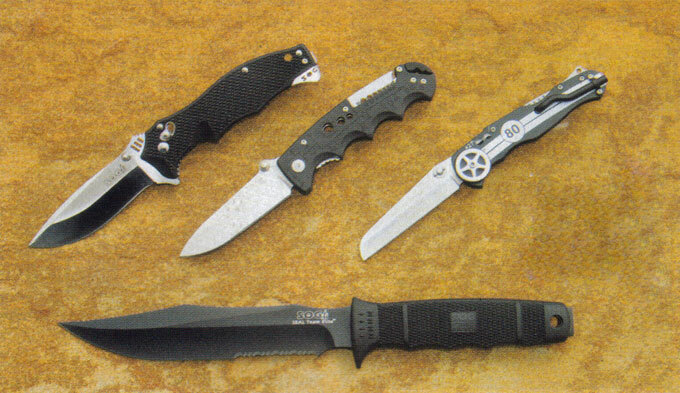 Knives such as the Recon Bowie and SOG Scuba/Demo were born into this arena and today, they are still available for both military and civilian use. 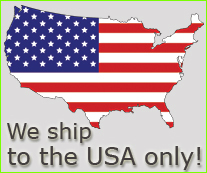 SOG Specialty Knives and Tools Inc was formed in 1986 and has a manufacturing plant in Lynnwood in Washington, USA. They specialise in fixed-blade and folding-blade knives, plus a range of multi-tools such as the PowerLock and PowerAssist, which have multiple uses. SOG blades are carried by Navy SEALs and Elite forces on fronts all around the world. 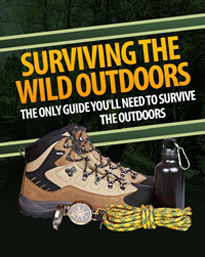 SOG also have a line of products under the Fusion brand, which include tactical tomahawks, a battle axe, throwing knives and a machete known as the Jungle Primitive. Four knives were sent down for review and are examples of SOG products from the handy pocket model to something a little more 'sinister'. It would be advisable to check the photo as you read, as words do not always do justice to fine pieces of equipment. This could be a very handy tool for anyone who has occasion to cut and strip electrical cable and wire. At only 3.3oz, it won't weigh your pocket down. Apart from being a folding knife with a razor-sharp blade, the Kilowatt has a stripper bar that will deal with seven of the smaller cable diameters. For slightly larger jobs, there is an adjustable spring-loaded UTP/ wire stripper at the back of the knife handle. For even larger jobs, there are three holes in the centre of the handle. Cable may be passed through the correct diameter and by closing the blade, the wire may be stripped in the usual manner. How clever is that! The overall length with the blade extended is 7.5" and the AUS8 stainless satin-polished blade length is 3.4". Rockwell hardness on the blade is 57-58c. 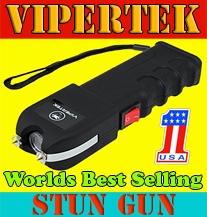 The handle is made from glass reinforced Zytel and has a pocket clip. Theme knives seem to be popular in the USA - just take an ordinary folder and dress it up to whatever is required. In this case, it's a trip back to the 1960s and 70s - the Muscle Car era. This knife has racing stripes, a wheel that turns, an exhaust pipe, a fan belt and pulley array and a gearshift clip, plus several other mementos. A nice touch is the number 43 on one side - Richard Petty's old NASCAR number. All of that aside, it's a nice folder, with an overall length of 7.25" and a blade length of 3.125". The satin-polished 440 stainless blade has a Rockwell hardness of 54-56c. The handle is aluminium and it weighs a mere 3.3oz. I'm not sure how these will sell to combat personel or hunters, but it's an interesting concept. This knife is named after the General Electric M61A1 Vulcan cannon as fitted to the F-15, F-16 and F-18 fighter aircraft. 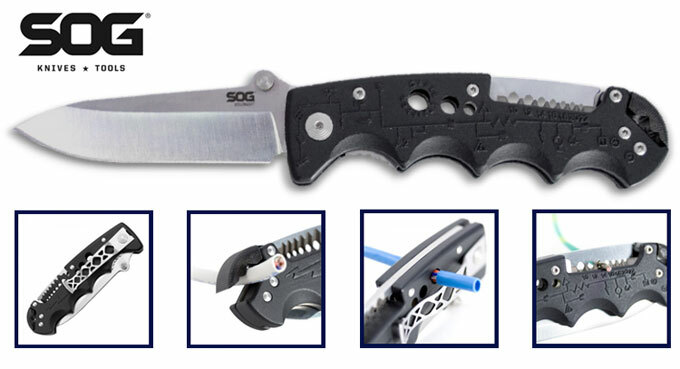 SOG claims that this knife isjust as formidable with strength and power in its construction. I would have to agree that this is one tough knife, with one of the sharpest, straight-edged blades that I have ever seen. The blade is 0.155" thick and sports a spear-point shape. The patented Arc-Lock is tested to more than 10001b of force at the lock. It's a large folder at 8.375" overall length and the VG-10 stainless satin-finished blade has a Rockwell hardness of 57-58c. It's a heavier folder at 5oz and the handle is constructed with tough glass reinforced Zytel with stainless steel liners. The pocket clip is of the low carry style and is reversible. The SEAL knife series was the result of extensive testing programs requested by the US Government, which took samples from most of the major US cutlery manufacturers. SOG SEAL knives were chosen for the Navy SEAL teams and have been battle proven in many theatres and trouble spots around the world. There is no nice way ofsaying it - this is a combat knife and a companion to those who must go in harm's way. It is also a big knife at 12.3" in length and the 7" AUS8 stainless blade is 0.240" thick. It is supplied with a nylon sheath and Velcro fasteners. Rockwell hardness is given at 57-58c and the finish is in black Hardcased TiNi. The blade is partially serrated for cutting webbing and the straight-edged section is razor-sharp. The Zytel handle has deeply recessed finger grooves and the back of the knife is a spine rasp for filing and notching. It's a heavy-duty item and weighs in at 10.3oz. It is the sort of knife that would look good in any knife enthusiast's collection, but I would imagine that carrying one around on one's person without a good reason may attract the attention of the authorities. 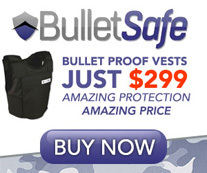 Retail prices varied considerably, so we would suggest shopping around for SOG gear. View All SEAL Team Elite models: View all available SOG SEAL Team Elite Knives here. Looking for other discount SOG knife models? SOG makes many different model blades suitable for hunting, shooting, medical and combat situations. The link below will give you the other options of currently available SOG knives for sale.